Division of the library of the Portuguese Rabbinical Seminary 'Eẓ Ḥayyim at Amsterdam, Holland. It was bequeathed in 1889 by D. R. Montezinos (b. Dec. 6, 1829), the well-known bibliophile of that city, and was dedicated on April 10, 1891, after the seminary had enlarged its structure in order to accommodate the valuable collection. 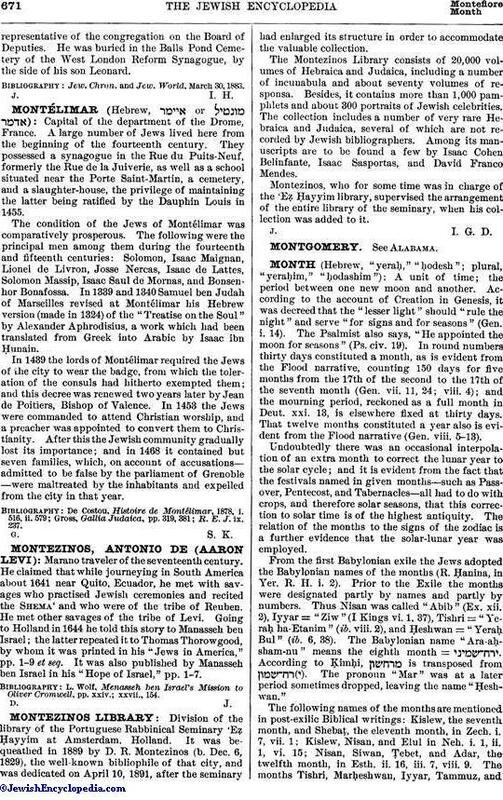 The Montezinos Library consists of 20,000 volumes of Hebraica and Judaica, including a number of incunabula and about seventy volumes of responsa. Besides, it contains more than 1,000 pamphlets and about 300 portraits of Jewish celebrities. The collection includes a number of very rare Hebraica and Judaica, several of which are not recorded by Jewish bibliographers. Among its manuscripts are to be found a few by Isaac Cohen Belinfante, Isaac Sasportas, and David Franco Mendes. Montezinos, who for some time was in charge of the 'Eẓ Ḥayyim library, supervised the arrangement of the entire library of the seminary, when his collection was added to it.